Jerry Della Femina is a legend in the advertising business. He created some of the nation’s most famous campaigns back in the 60s and 70s. He was the inspiration for the TV series “Mad Men.” And now he’s had it up to here with President Obama. Legendary ad man Jerry Della Femina blames President Obama for having to sell his Hamptons restaurant. In a column for the East Hampton Independent, the inspiration behind the “Mad Men” series says that in 2008, he “decided that this country was falling in love with an attractive, great-speechmaking hustler/socialist” and that he was “dropping out” and would sell off “my houses, my advertising business, my newspaper and my restaurant.” Della Femina sealed a deal this week to sell his Hamptons eatery to the owners of the Houston’s chain. 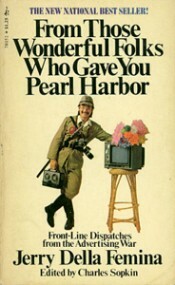 If you’ve never read Della Femina’s book, “From Those Wonderful Folks Who Gave You Pearl Harbor,” find an old copy on Amazon.com and buy it. His exploits in the ad business are guaranteed to make you laugh out loud. Well, I think that someone ought to mention to said “fatcat” that your purchases in gold & silver are logged, tracked, date & time-stamped in triplicate. What’s that you say, you want physical possesion of your metals? Oh no, we “store” it for you. Well, I guess we could ship some to you as long as you pormise to store it in a place designated by us like say, a bank or safety deposit box where only “you” will know about it and only “you” will have a key & access to it. Oh, and yes, we have a great bridge to sell you too….. This may be nitpicking but MadMen’s Don Draper was inspired by Mr. Draper Kramer, a creative director at Leo Burnett in Chicago during the 50’s and 60’s who eventually opened his own agency. Other than that I read your site daily and it is very, very good. I don’t know the guy or his history but I like him already. He has stones and I see him as swimming to safe haven, not a rat jumping the USS TITANIC. I really dislike that analogy. The rats don’t cause the ship to sink. There really isn’t a good ship analogy because the captains, who were responsible if at fault or not, would go down with their ships. I’m not sure what a proper one would be…. Maybe in the movie Space Balls where Dark Helmet, the tiny insecure dictator wanna be, is fighting for an escape pod after dooming the ship. I see your point. Your analogy may actually be better, because this isn’t really a humorous situation. I just wanted to be sarcastic because being cynical was more painful. I don’t know what he’s complaining about. If he would just join the Borg like GE and GM did, he would get plenty of Party favors. There are some things some people still won’t do for money and Jerry may be one of those people!